Edith Kiertzner Heath (May 24, 1911 – December 27, 2005) was an American studio potter “but soon became involved in the design and production of pottery and tableware on a far larger scale than that of most studio potters.” In 1948, Edith founded Heath Ceramics. The company, well known for its mid-century modern ceramic tableware, including “Heathware,” and architectural tiles, is still operating in Sausalito, in Marin County of the San Francisco Bay Area, California, United States. 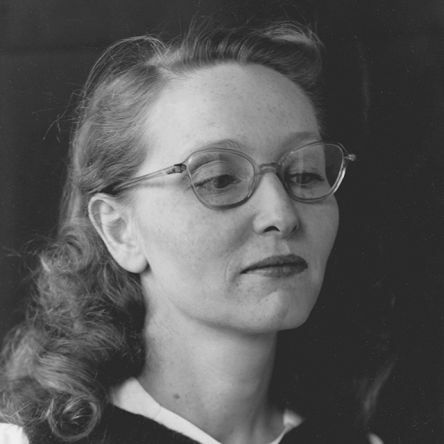 Edith Kierzner was born May 24, 1911, in Ida Grove, Iowa, forty miles east of Sioux City, Iowa, to Danish immigrants Nils and Karoline Kierzner. In 1931, Edith enrolled at the Chicago Normal School, later renamed Chicago Teachers College, and graduated in 1934. She enrolled part-time at the Art Institute of Chicago after graduation taking her first ceramic course. In 1938, Edith married Brian Heath. Relocating to San Francisco, Edith accepted a position as an art teacher at the Presidio Hill School and audited classes at the California School of Fine Arts. She developed a clay body in these classes which she adapted many times for her production work. Not being able to have as much access to the pottery equipment, Edith pursued her ceramic interests on her own converting a treadle sewing machine into a pottery wheel. In 1943, she studied eutectics with Willard Kahn through the University of California extension courses. In 1944, her first major show was at the California Palace of the Legion of Honor. She also participated in the Syracuse Ceramic Nationals 11(1946) to 15(1950). A buyer from San Francisco retailer Gumps approached Edith to supply their store with her high quality hand-thrown pottery using the company’s pottery studio. She accepted the opportunity, while continuing to work in her own studio. “She became convinced of the opportunities that studio potters had if they would undertake production work to fill the wartime import void.” In 1947, Edith began to design and execute a limited hand-thrown production of her pottery and tableware with four apprentices in her own studio. The Heath’s purchased land in an industrial area of Sausalito where Edith worked with architects Robert Marquis and Claude Stoller to design her ideal factory space. 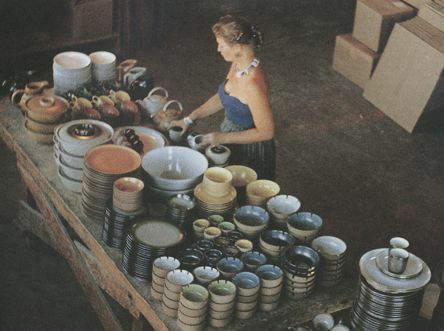 Major retailers began to order Edith’s tableware, and in 1948 she opened Heath Ceramics in Sausalito, California. By 1949, Heath ceramics was producing 100,000 pieces of ware a year. 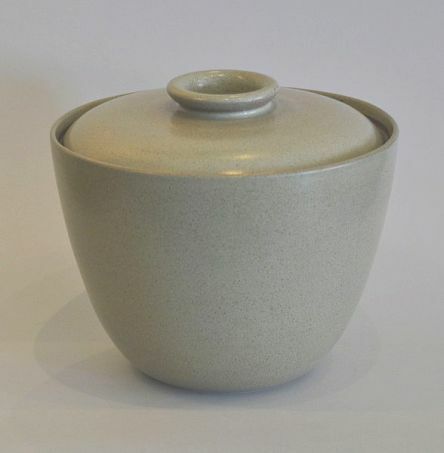 Heath Ceramics was purchased by Robin Petravic and Catherine Bailey in 2003. Edith Heath died on December 27, 2005 at her home in Tiburon, California. Edith Heath’s “Coupe” line remains in demand and has been in constant production since 1948, with periodic changes to the texture and color of the glazes. Other Heath pottery lines include “Rim,” designed in 1960, and “Plaza,” designed in the 1980s. The Pasadena Art Museum, now the Norton Simon Museum, in Pasadena, California and designed by Pasadena architects Thornton Ladd and John Kelsey of the firm ‘Ladd + Kelsey’ used the architectural tiles. The distinctive and modern curvilinear exterior facade is faced in 115,000 glazed tiles, in varying rich brown tones with an undulating surface, made by Edith Heath. They are part of the backdrop many see when viewing the New Year’s Rose Parade on television. Klausner, Amos (2006). Heath Ceramics, The Complexity of Simplicity. San Francisco: Chronicle Books, LLC. p. 20. ISBN 0-8118-5560-0. Bray, Hazel V. (1980). The Potter’s Art in California 1885-1955. Oakland, CA: The Oakland Museum Art Department. p. 62. ISBN 0-295-96200-3. Marsha Ginsburg (2006-01-01). “Edith Heath — renowned ceramicist”. San Francisco Chronicle. Retrieved 2006-09-14. Evans, Paul (1990). Art Pottery of the United States : An Encyclopedia of Producers and Their Marks, Together With a Directory of Studio Potters Working in the United States Through 1960. New York: Feingold & Lewis Pub. Corp. p. 420. ISBN 0-9619577-0-0. “Proposed Heath Ceramics factory · Environmental Design Archives Exhibitions”. exhibits.ced.berkeley.edu. Retrieved 2017-06-30. “HeathCeramics.com: About Heath”. Archived from the original on 2006-08-27. Retrieved 2006-09-14. Zahid Sardar (2004-02-01). “Home Is Where the Heath Is: A Bay Area pottery tradition continues under new ownership”. San Francisco Chronicle. Retrieved 2006-09-14. Chang, Jade (2005). Art/Shop/Eat Los Angeles. Somerset Books. pp. 90–98. ISBN 1-905131-06-2.